Sebastien Calbry is a master craftsman of gimmicked playing cards. He has collaborated with other magicians to produce effects that use gimmicked cards such as Badge, Off-Set and Manivelle. Gimmicked Card No 1 – this allows you to write or draw something on the back of a playing card. Then, by waving the card, you can magically change the writing or drawing to a different one. An application will be righting a wrong prediction written on the back of a playing card. Gimmicked Card No 2 – this allows you to transform the back of a playing card. The gimmicked is specially constructed such that it allows you to first change two-thirds of the back, and then visually changes the last one-third of the back. An application will be to locate a selected card only to have it on a wrong colour back. With a wave of your hand, you change the back colour to the correct one. Gimmicked Card No 3 – this has the same function and design of gimmicked card no 2, except that it allows you to transform the face of a playing card. Again, you can first transform two-thirds of the face and then the final one-third. An obvious application will be righting a wrong selected card. You receive all 3 gimmicked cards made with bicycle cards, and a password to download an instructional video. The video is in the French language but it has English sub-titles on the appropriate segments. The 3 gimmicked cards are very well-made. They all work very smoothly and silently. This is because they do not contain magnets that can make noise, or elastic threads that may break. They are also very easy to operate. Unfortunately, the change cannot be performed surrounded and the transformed card cannot be handed out for examination. Nevertheless, the change is quite visual and magical. 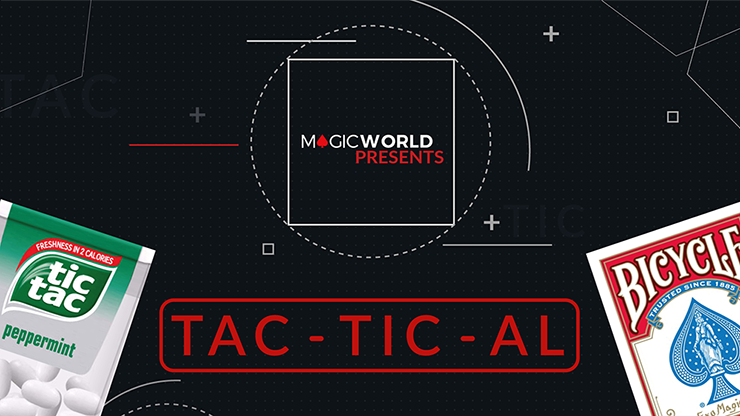 “Tac-Tic-Al” is a visual transformation of a small box of Tic Tac mints into a regular box of playing cards. You receive 2 gimmicks: one is for you to transform a small box of mints into a regular deck of cards, and the other is to enable you to change a miniaturized box of playing cards into a regular box of cards. You also receive a password to download an instructional 20 minutes video. The Tic Tac gimmick comes ready to use while the miniaturised box gimmick needs a little touch-up to make it operational. You are supplied with the necessary item to accomplish this, and the instructional video shows you how to do it. It only takes less than a minute to do this. It is unclear why the miniaturised box gimmick comes incomplete. Perhaps they want you to practice repairing it in case either gimmick breaks down from continued use. Essentially, the 2 gimmicks work on the same principle. The gimmicks are made in bicycle cards. When ordering, you need to specify whether you want the gimmicks to be in red or blue bicycle backs. In effect, you show either the small mint box or the miniaturized card box in your hand. Simply by throwing it into the other hand, it changes into a box of regular bicycle playing cards. This makes a good lead-in to a card trick. Of course, it makes better sense if what you are doing prior to this transformation involves either the small Tic Tac box or the miniaturized cards. The change is quite visual. After the transformation, you can take out the cards from the card box and the card box can be handed out for examination. With the cards, you can proceed with your favourite card effects. In the video, there are 2 camera versions of the change which make no sense since they do not involve the gimmicks. They are meant to be taken advantage of because the transformations depend on the camera’s changing directions. If you are looking for a visual lead-in to card tricks, Tac-Tic-Al may be what you are looking for.
" Visions” by Matthew Wright is both an usual card revelation and a drawing duplication effect using a deck of playing cards. In actual performance, the performer says he tries to establish a mental connection with a spectator. He asks her to think of a simple drawing that a child might draw, but not one that consists simply of a shape such as a square or circle or triangle. Let us say she says a tree. The performer exclaims excitingly that his favourite picture is also that of a tree, and therefore they are both in sync with one another! The audience is smiling because the performer merely repeats the object uttered by the spectator. The performer then brings out a deck of cards and asks the spectator to cut it anywhere she likes. The card cut to is shown to be, say, Queen of Diamonds. The performer then says that his favourite card is also the Queen of Diamonds. This time, the audience laughs because the performer claims a second time that his favourite card also matches the selected card after he sees that card. To prove it is his favourite card, he takes out the Queen of Diamonds from his trouser pocket. Now the audience laughs for a different reason – the performer somehow is able to quickly take out a duplicate of the exact chosen card from his pocket. To show the audience why this is his favourite card, the performer turns the card over to reveal that on the back of this card, which is of a different colour (red) to the deck in use (blue), is a simple drawing of a tree – his favourite picture! Usually, at this stage, in addition to laughing out loud, the audience cannot help it but to applause standing up! The ending has such a devastating effect on the audience because nobody can see this kicker climax coming! You receive the special deck that comprises half blue back bicycle cards and half red bicycle back cards. The red cards have most of the drawings already printed on their backs. You are also supplied a small gimmicked envelope made of indestructible paper, a DIY item to complete your customization of the deck of cards, and a password to download the instructional video. In the video, Matthew Wright explains how to finish customizing and assembling your deck of cards. This is quite easy to do since almost all of the drawings on the backs of the red cards have been prepared for you. What is of great interest is Matthew’s exposition on the psychology of the pictures chosen by him. He also gives you very easy outs if the selected drawing is not what you have expected from a spectator. In the video, Matthew also teaches you another presentation using the gimmicked enveloped supplied. In this presentation, the envelope is first placed conspicuously on the table. After the spectator revealed her favourite simple drawing and selected her card, the prediction envelope is opened to reveal that inside it is his business card which is clipped to a playing card that is a duplicate of the spectator’s chosen card. When this card is turned over, it is shown to have a different colour back and has the spectator’s favouite drawing printed on it! If you possess a peek wallet as well as one that allows card to wallet effect, you can have a different presentation in which the spectator does not have to reveal her favourite drawing to you. She merely draws her picture on a business card and you keep it safe inside your wallet. Later, in a different and zippered compartment in your wallet, you take out your favourite card that is a duplicate of her chosen card and it has a duplicate of her drawing on its back. It is a mentalism effect that has comedy built-in as well. The entire effect is self-contained and does not require pre-show, stooges, secret or pocket writing. It resets easily and is ideal for walk-around performances. Yet, it is suitable for parlour or even stage. The effect is adapted from Eugene Burger’s “Thought Stealer” and Chris Rawlins’ “I.D.D.” It does not require difficult sleight-of-hand. If you perform the basic effect as described earlier, the audience will not see the climax coming. The ending really kills them! (10/10 stars rating). Everybody loves the Omni Deck effect where a deck of cards becomes a clear block of solid plastic in a spectator’s hand. So did Joshua Janousky. This inspired him to come out with the Invisibill which is the bill equivalent to Omni Deck. This is a piece of currency bill that is made of transparent plastic sheet that has the outlines of the currency prints on it. The basic effect is called “In The Hand Change”. The performer displays 2 $1 bills, one in each hand. He requests a spectator to freely choose one. Whichever bill is selected by the spectator, this spectator folds it into eights. The performer himself folds the non-selected bill into eights. The 2 folded bills are taken together and placed inside the spectator’s fist. The performer then withdraws one folded bill from the spectator’s closed fist, leaving the other folded bill inside it. The performer proceeds to vanish the bill he took from the spectator. He says that the bill inside the spectator’s fist will also disappear. The spectator can still feel the folded bill in the fist. When the spectator finally opens her fist, she finds the transparent folded bill. Her bill almost vanished! This has the same wow moment as the Omni Deck. 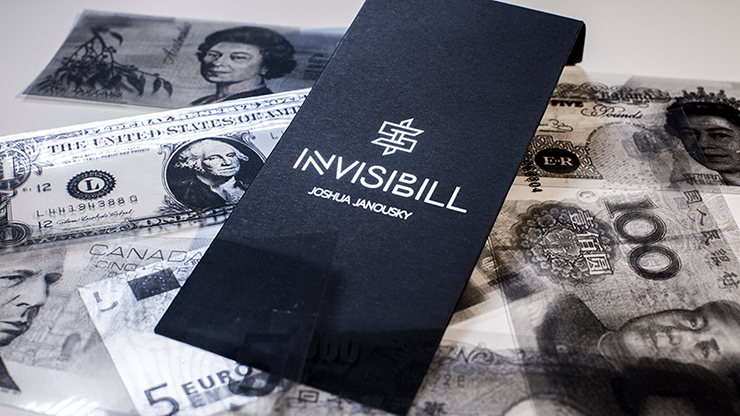 You receive a stack of some 7 transparent bills from well-known countries in the world. They comprise $1 American, €5 Euro, $5 Australian, £5 British, $5 Canadian, ¥1,000 Japanese Yen and ¥100 Chinese Yuan. You also receive a password to download an instructional video. The video has Josh Janousky performing and explaining various versions of Invisibill. You can also download templates for 19 transparent bills from various well known countries in the world. In “Visibility”, an invisible folded piece of currency bill becomes a transparent plastic folded bill, which then materializes into a real folded currency bill. In “Remove Colour”, the performer folds a piece of bill into eights, and then proceeds to extract the colour from the bill, leaving a pieced of folded transparent plastic bill behind. There is a bonus effect which does not use the visibill gimmick. It is called “Credit2cash”. The performer displays a credit card which visibly transforms into several pieces of currency bills which can be displayed singly. Nothing special is supplied, and Josh teaches you how to prepare your own credit card for this effect. If you only perform the “In The Hand Change” effect, it would have paid well for your investment in this product. This effect is best performed with plastic bills because the climax is also a clear plastic currency. Although you can perform with borrowed bills, it is better to perform with your own bills which is pre-folded to make the handling much easier. Josh says in the video that this is not magic for the magic boys – ie a magician will know how the effect is accomplished. Rather, it is entertaining magic that is meant to wow the audience, just like the effect of using the Omni Deck. Doc Eason’s “Anniversary Waltz” has become a classic card effect. It is the fusion of 2 separately selected and signed cards back-to-back so that you get a single card with one signed selection on one side and the other signed selection on the other side. It is an unusual card for the 2 spectators to keep as a souvenir. What makes this effect so strong is the involvement of 2 individuals who have a strong bonding between them. The climax of the fused card has a special meaning for the couple, and it also tends to tug at the heart-strings of the rest of the audience. 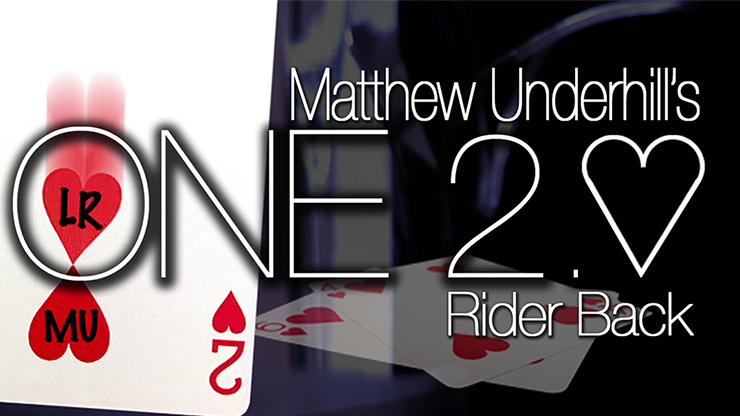 Matthew Underhill’s original “One” has a more visual effect than the “Anniversary Waltz”. A card selected happens to be a hearts suit, eg a four of hearts. The back of this card can be signed. One of the couple’s initials are written on a heart on the card. His or her partner’s initials are written on another heart on the same card. The performer visually draws one of the initialed hearts with his thumb and brings it next to the other initialed heart on the card, so that the 2 hearts “kiss” one another at their pointed ends. This unusual card is then given out as a souvenir to the couple who participated in the magic. In “One 2.0”, you get an updated version. The souvenir card is now available in red bicycle back. The heart that “moves” is now on the non-index corner of the card. You receive 20 specially printed cards, 10 of the “fused” two of hearts and 10 of the “fused” four of hearts. You also receive 20 single heart pips to be used with these specially printed cards. You have to supply your own deck of red bicycle cards. You are also given a password to download the instructional video. In the 65 minutes video, you get to learn 2 different presentations and handlings, one is by David Penn and the other one is from Justin Miller. In David Penn’s handling, you have to use the original two or four of hearts card respectively. In Justin Miller’s version, you do not need the original card. You can choose whichever one handling that suits your performing and presentation style. You also need a special something to adhere the hearts pip onto the specially printed card. Only a little of this is used in each performance. This should be supplied together with the gimmicked cards so that the purchaser can be assured of the correct type to use instead of having to experiment with different products. It will also enable the purchaser to perform the effect straight away, instead of having to purchase the stuff separately if he does not have it in his magic inventory. You may want to compare this effect with the original “Anniversary Waltz”. Winning hands down for this effect is of course the very visual and magical movement of the initialed hearts pip across the card to join the other initialed hearts pip. However, because of the limited size of the hearts pip, the initials of the 2 people will be quite small. The “Anniversary Waltz”, on the other hand, has large signatures across the 2 sides of the card. “One 2.0” has a greater possibility of awkward moments than the “Anniversary Waltz” when the movable pip encounters resistance to move or when it becomes dislodged prematurely. Even if you own the “Anniversary Waltz”, it is good to have “One 2.0”. They can both be performed for the same audience, and it will enhance the overall effect. This is a novelty card trick. In effect, a card is selected and then lost in the deck. The performer brings out a picture of a miniaturised dard board. The spectator who selected the card is given an “invisible” dart and asked to “throw” this dart at the dart board. When he does so, the performer shakes his dart board. Visually, a picture of a dart suddenly appears, impaling the dart board. This dart is also seen piercing through a small card that has the exact identity of the chosen card. The imaginery dart has magically materialised and found the selected card as well! This will bring an expression of awe from the audience. The performer then shakes the dart board again. This time, the picture of the dart and the chosen card vanish. When the performer opens up his other hand, inside his palm is seen a physical manifestation of the red miniature dart with its tip still piercing through a small card that has the identity of the selected card. The 2-dimentional dart and card have become 3-dimentional and real in the performer’s hand. A befitting close to a novel and blaffing effect. You are supplied the specially gimmicked picture of the dart board, 2 miniaturised red darts (one is for spare), 10 specially printed stickers depicting the seven of hearts, and a sheet of printed instructions. The spare stickers that are provided allow you to have various endings. In one, the miniaturised red dart manifests itself physically but not the small card. This is then found stuck to the body of the spectator who selected the card. In another, the seven of hearts is not the selected card. Let us say the chosen card is the four of spades. When the small card appears, the audience thinks the performer has made a mistake. The miniaturised red dart then manifests itself physically but not the tiny card. When the deck of cards is spread face downwards, the seven of hearts sticker is found stuck to the back of one card. When this card is turned over, it is ideed the four of spades. The effect is easy to do, and reset instantly. This is a card trick that involves a dart board. A novelty effect never fails to bring excitement to any audience.